With a legacy of over 10 years, Dyna premium beauty soap is known for its high quality and pure ingredients. Dyna has been revamped in 2017 and is now available in 3 refreshed ingredient combinations specially crafted to delight you. The all new range of Dyna premium beauty soap leaves your skin feeling nourished and more fragrant than ever before. 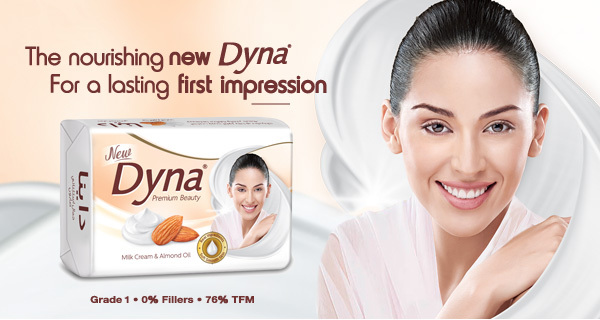 Packed with the goodness of 100% real ingredients and exciting new fragrances, new Dyna ensures you confidence to make your first impression, a beautiful and lasting impression. Milk Cream & Almond oil’s moisturising magic keeps your skin nourished and healthy. Its goodness gives you a natural glow and a long-lasting soothing fragrance. Lime’s enriching freshness combined with Aloe Vera’s essential nourishment keeps your skin young looking. Its long-lasting and refreshing fragrance provides for a zestful bathing experience. The goodness of rose extracts and milk cream hydrates and tones your skin. Combined with an alluring fragrance, it gives your skin a soft and supple feel. Dyna Skin Care Glycerin Bar nourishes your skin and its aroma oils give you an alluring bathing experience. Glycerine, a natural moisturizer, hydrates and rejuvenates your skin; and is an ideal option for all skin types.